Here at Titleist South East Asia, we are gearing up and getting very excited about the launch of the new Titleist 714 Irons. 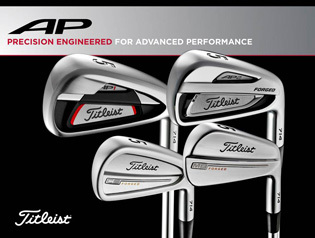 Available in AP1, AP2, CB and MB models, the new Titleist 714 irons will hit the shelves across South East Asia on the 8th of November 2013. As members of MyGolf.com.my, it is with great pleasure that I would like to invite 10 of you (and a friend) to a sneak peak of the new irons in Kuala Lumpur at an hour long demo of the new irons at The Mines Golf Club on October 9th 2013. The day will be split into 1 hour sessions, with 10 people to each session (the first session starts at 1pm and the last starts at 6pm). In your session, you will begin by being introduced to the new irons and the changes and performance benefits of each new model will be explained. Then you will have plenty of time to demo each of the models, with our product experts on hand to advise you as to which model is best for you. We still have some spaces left for tomorrow's 714 Iron Demo. Do let me know today if you are keen to attend by emailing me at thomas_hutton@acushnetgolf.com. Thanks and I hope to see you tomorrow. Cheers.